The Del Grande Dealer Group Capitol Volkswagen dealership in San Jose, CA, recently remodeled its showroom, upgrading its look to include a video wall and accompanying sound system. 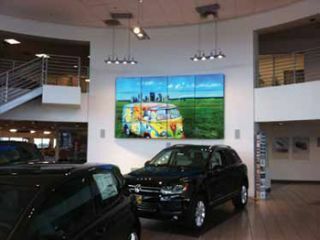 (Left) The video wall at Del Grande Dealer Group Capitol Volkswagen in San Jose, CA is made up of 16 Samsung televisions supported by Peerless television mounts. (Right) The video wall install incorporates Niles in-wall speakers, Velodyne in-wall subwoofers, and a RTI controller with in-wall and iPad function. To handle the installation of the electronics, the Del Grande Dealer Group turned to Jonathan Wright, owner of Elite Controls, a dealer of audio and video products. “The dealership was in the process of having their showroom remodeled and asked us to create a visual and acoustic ‘wow factor,’” Wright said. Unfamiliar with this type of project, Wright contacted Phil Parrish with AVAD, a distributor of custom electronics, to get a better understanding of the most current options in designing a video wall. “At Elite Controls, we understand that in order to stay up to date with the latest technologies and their applications, we sometimes need to ask experts outside of our company for assistance with new ideas,” Wright said. As more than just a distributor, AVAD provides a range of technical assistance and business management services to dealers like Elite Controls. One of the services AVAD offers to dealers at no additional charge is access to the AVAD system design group, a fully dedicated design team that provides materials, information, and advice about projects of any size. “We have tried to use other ‘design teams’ before with absolutely no luck, but AVAD’s design team went above and beyond what we ever expected,” Wright said. With the help of the AVAD system design group, the Elite Controls team was able to construct an intricate video wall at the dealership. The wall is made up of 16 Samsung televisions supported by Peerless television mounts and a Middle Atlantic rack system. It incorporates Niles in-wall speakers, Velodyne in-wall subwoofers, and a RTI controller with in-wall and iPad function. The video wall also uses Key Digital HDMI splitters and converters, a Kramer HDMI switch, Pro Flex HDMIs, Gefen RS-232 converters, and an Onkyo AV receiver.